Daily mental exercise reduces the risk of dementia. Mahjong is a game of strategy and skill played with tiles featuring Chinese characters. According to recent psychiatric and cognitive behavioural studies, it is a mental exercise that can have powerful effects on improving memory and reducing the risk of dementia in seniors. Memoera is an easy to use device that activates multiple brain functions and several senses simultaneously. Memoera offers quizzes and games that activate memory effectively. Challenging and meaningful activity brings a feeling of success and wellbeing. 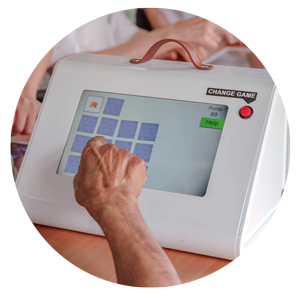 Memoera has been tested with more than a thousand people with dementia, and they like to use the device. Memoera gives meaningful activity and making things together with the patient brings joy. Memoera enhances the sense of community and gives more active interaction between the patient and care taker. Perception and deduction, language-based, memory activities and mathematical skills get activated through Memoera in a fun way. Everyone should have a chance to learn new skills, needed in the digital world. For example watching youtube videos, browsing the internet or sending e-mail. Digital Academy can offer insights into issues ranging from creating awareness, short talks on individual interests and share information. It provides a possibility to learn something new or just to pass the time with its interesting content and things to do.